Projects aimed at restoring North Korea’s forests are budding again amid warmer inter-Korean ties. At high-level talks held Friday, the two Koreas agreed to hold a meeting for cross-border reforestation projects, while announcing dates for other inter-Korean talks. Unification Minister Cho Myoung-gyon said the meeting on reforestation would likely take place in late June. “In a nutshell, North Korea’s devastated woodlands affect the entire Korean Peninsula, not just North Korea,” Shin Hye-ji, a researcher at Green Asia Organization under the nonprofit Climate Change Center, told The Korea Herald. Green Asia Organization operates a seedling farm at the South’s border county of Cheorwon, Gangwon Province. “The reforestation projects will help reduce the cost of forest recovery once the Korean Peninsula is unified again. Also, North Korea is a country vulnerable to climate change and the projects will help the North deal with the issue more smoothly,” Shin said. North Korea’s decimated woodlands have plagued the Korean Peninsula for more than a decade. Some 2.84 million hectares of the North’s total forest area of 89.9 million hectares have been destroyed as of 2008, according to a report released by the Ministry of Unification last month, citing research by the National Institute of Forest Science. This is roughly 47 times the size of Seoul. The report is expected to be updated by the end of the year, as the research is conducted every decade, according to the ministry. South Korea’s efforts to aid North Korea’s forest dates back to 1999, but the projects were largely halted after 2010, when border tensions rose on the back of Pyongyang’s military provocations and pursuit of nuclear weapons. The Gyeonggi Provincial Government, which completed construction of a seedling farm in the North’s border city of Kaesong in May 2008, said earlier this month that they plan to reactive the farm once economic sanctions on North Korea are lifted. The project has been in limbo as visits to North Korea have been banned. Private farms managed by civic groups or nongovernmental organizations, including GAO, are more recent developments. Since coming to power in late 2011, North Korean leader Kim Jong-un has been making efforts to restore ecology in his country. In 2012, Kim announced a plan to plant 6.5 billion trees by 2023 and has been holding tree-planting events annually on North Korea’s Arbor Day, which falls on March 2. In 2015, Kim stressed that such rocky and barren land should not be handed down to future generations, according to the North’s state-run Korean Central News Agency. North Korea also opened a forestry science school at the elite Kim Il-sung University in March 2017 and broke ground for a forestry research institute in Pyongyang earlier this year. But experts note the obvious limits of such endeavors. “North Korea’s reforestation project is centered on building seedling breeding centers and cultivating seedlings. It lacks the ability to actually plant trees and shape forests. It’s mostly due to the lack of budget in the central government, infrastructure and awareness among its citizens to responsibly deal with the issue,” said Park Kyung-seok, a researcher at the National Institute of Forest Science. To aid the North, the South Korean government launched a task force in May to conduct research on North Korea’s forestation. Seedling farms here have also begun to spring back to life. “We are currently preparing to send seedlings to North Korea and planting a new batch at our seedling farm in Gangwon Province. Relevant communications with both our government and North Korea are not active yet, but (with the recent mood of peace on the peninsula) we are getting ready,” Shin said. Despite heightened border tensions last year that led to bleak outlooks for cross-border projects, the organization was nevertheless busy planting and nurturing trees, Shin added. It had refused to stay dormant amid frozen ties. 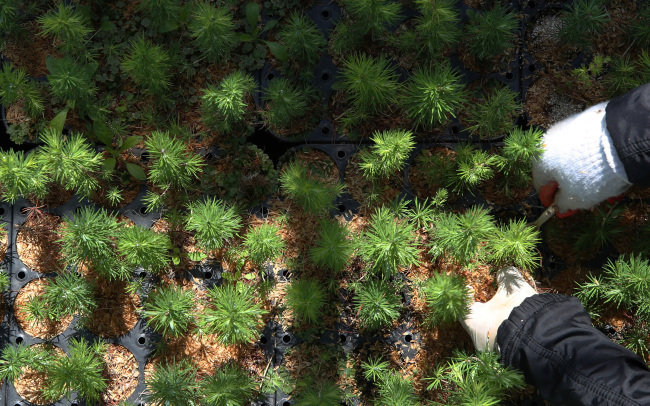 GAO planted 460,000 tamarack and Korean pine trees last spring and plans to add more this year. It also recently leased an additional strip of nearby land to expand farmland and infrastructure. Mountains in North Korea are believed to have suffered severe deforestation in recent decades, especially after a crippling famine swept through the impoverished nation in the mid to late-1990s, when people fell trees for fuel and to clear land for arable farmland. The country’s lack of preparedness and infrastructure for dealing with natural disasters, including floods and forest fires, contributed to the damage.